Many clarinet players have vivid memories of the perfect reed from the perfect performance. All of the stars aligned just perfectly and the gift of the perfect reed was granted. This experience is so rare that for some of us, we set that reed aside as to not wear it out just in case we will again need to call upon its magic. I myself have a case that sits on the back of my reed table filled with fabled reeds, hardly played in at all, that sit indefinitely waiting to be called upon… which never happens. I do have one reed in particular, made with oddly soft cane that required a somewhat shorter profile than I usually make in order to play. However, it had a certain ease of playing that lends to performing in dead spaces, i.e. an audition room. In fact, I’ve now won TWO auditions playing with this reed, auditions that were to fewer than 8 months apart. I haven’t played the reed since… you know, just in case. Well, last night, in a casual conversation about reeds that all clarinet players will inevitably have, my colleague in the Portland Opera exclaimed that: “I have reeds older than you!” This was followed by the story of the perfect performance on the perfect reed he had had, in 1974 (yes, before I was born), of l’histoir du soldat. He admitted that he’d set the reed aside after the performance hoping that he would one day learn how to make reeds himself and copy this perfect reed. 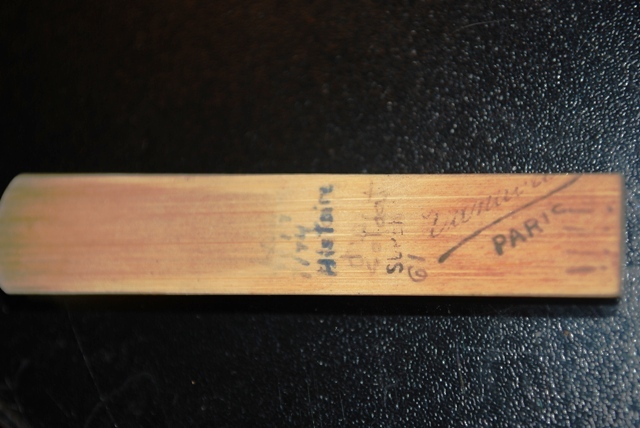 Well, 36 years later, this reed was STILL in his clarinet case! I immediately told him that I could model the reed and perhaps reproduce it myself for him. After a few minutes of digging around in his case (was the case older than me too? ), he handed me an old Vandoren, of unknown strength, that was in surprisingly good condition. When I told him I’d get to work on duplicating it, he confessed that he didn’t even play on the same mouthpiece style that he did in the 1970s and probably wouldn’t even like the reed anymore. But, like any clarinet player could relate to in a very personal way, he held on to it, just in case one day, he would need to call upon the perfect reed once again. Stay tuned for my next post where I will give an analysis of this reed and perhaps even have a viable copy! Welcome to Reed-help.com. Your site for everything related to clarinet reeds.